Greenville Dentist; Dr. Nick Dziedziejko, with the team. 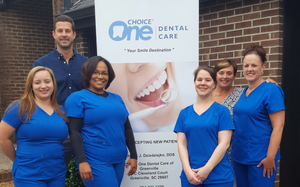 At Choice One Dental Care of Greenville, our goal is to provide high-quality dental services in a comfortable, laid-back environment. “I like to keep things light and the workplace enjoyable,” says Dr. Nick Dziedziejko who has been at the practice since 2007. We are blessed to have a great office with warm and friendly staff. We’re truly like a family as a lot of the staff has been here for many years. We are a family practice for the most part, and will see small children for cleanings. There may be times, however, when we will occasionally refer out to a pediatric dentist if certain treatment needs to be performed. If you’d like to smile brighter and enjoy optimal oral health, we invite you to contact the practice today to schedule an appointment!